Marcus Zúñiga, "El Imán," 2016, acrylic, magnets, iron filling, LED panels, 43 x 33 x 33"
“Ya Veo,” meaning “I see” in Spanish, is emerging New Mexico artist Marcus Zúñiga’s first solo exhibition, highlighting two years of work and a lifetime of cosmic exploration. 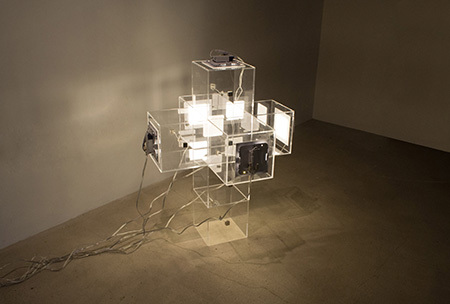 New media projections and sculptures represent the artist’s perception of the universe contextualized through the filter of his Mexican-American heritage. While the vision is specific to Zúñiga’s ancestral roots, it’s also an accessible invitation for the viewer to contemplate their own ephemeral existence and conscious place in the universe. The accessibility of Zúñiga’s concept is actualized through basic materials and seemingly simple constructs. “Universe,” the first piece we encounter upon entering the intimate exhibition space, is a tangle of LED lights wrapped around an embroidery hoop. Even though basic in its design, the result is complex as an effective illusion of an endless galaxy of scattered stars. Video projections displayed in the back room were shot with an iPhone, which Zúñiga used to capture an eclipse through the viewfinder of a telescope for “Eclipse Total.” Zúñiga urges the viewer to consider his pieces and their cosmic illusion through a renewed perspective by titling most of the works with Spanish and Nahuatl (Aztec) words and phrases. “The embracing of other culture’s interpretation of the universe is necessary to the role it will have for their cultural identity in the future,” says the artist.